Mysuru: Every other day, Tamil Nadu raises Cauvery water sharing issue and regularly knocks the doors of Supreme Court demanding its share of water irrespective of rainfall and water storage levels in dams of Karnataka along the Cauvery Basin. Is it not its (Tamil Nadu) duty to come to the rescue of people of flood and landslide-ravaged Kodagu (the birth place of River Cauvery) during their time of distress? This question of natural justice has been raised by Saraswati Samman recipient and noted Kannada Litterateur Dr. S.L. Bhyrappa. Tamil Nadu is the biggest beneficiary of River Cauvery for its drinking water, livelihood and irrigation needs and that State ensures that Karnataka releases water regularly even though there is less rainfall and the storage levels in the dams hit rock bottom. “Tamil Nadu must come to the rescue of Kodagu residents and it will be a violation of natural justice if it does not help the affected people of Kodagu. 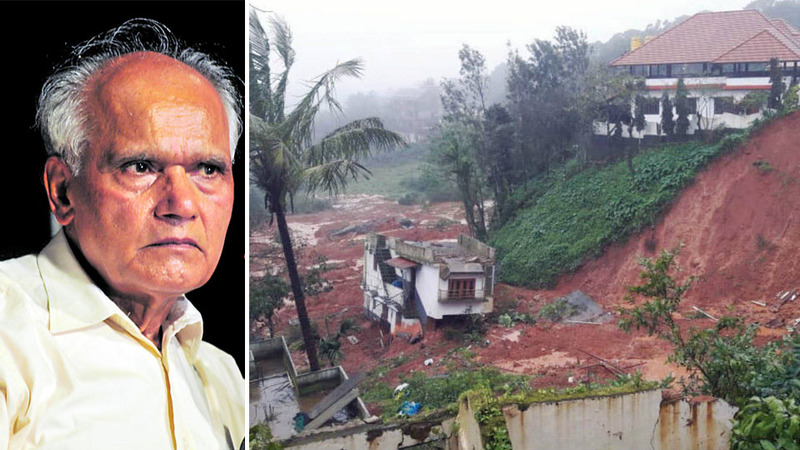 Why is Tamil Nadu silent on this though it takes all the benefits from the river that takes birth in Kodagu,” Dr. Bhyrappa questioned. “If it is Karnataka’s ‘duty’ to grow forests and protect River Cauvery, why Tamil Nadu has the sole “right” only to use the water without doing any duties,” he questioned. 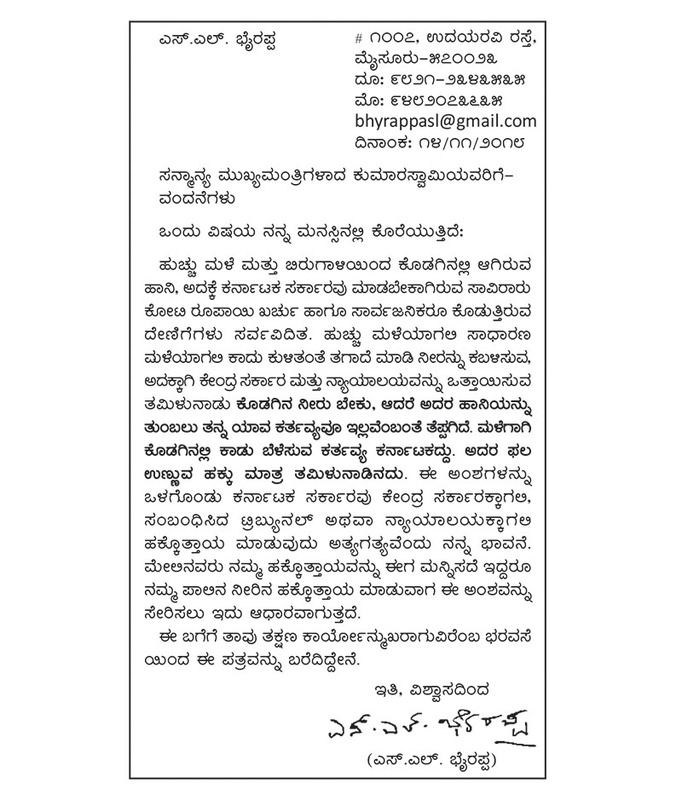 In a letter to Karnataka CM H.D. Kumaraswamy, the noted litterateur whose novels attempt to bring in a change in the society said that irrespective of the rainfall in Kodagu, Tamil Nadu waits for an opportunity to clash with Karnataka in the Courts of law on river water sharing. “While TN fights for its “right”, it seems to forget its “duty” or “obligation.” It wants water from Kodagu but is keeping quiet when the birthplace of Cauvery is suffering from natural calamity. How fair is it,” he asked.